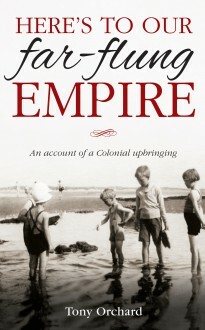 ‘Had it not been for World War Two and the ‘miracle of Dunkirk’ I, along with thousands of other children with parents in the colonies of the then British Empire, would have had an upbringing restricted to boarding schools in Britain, with holidays spent with other folk in loco parentis. ‘However, once out of the box aged just fourteen, I enjoyed a liberating run for the next seventeen years, seeing much of the world and living in three British dominions… ‘Such an upbringing was out of the ordinary. It contained some lows, some long plateaux and many more highs and if, as they say, variety is the spice of life, then mine had it in spades…’ Tony Orchard was born in Kenya in 1926. Most of the next fourteen years were spent at boarding schools in England and on holidays with relatives and guardians. Dunkirk provided the catalyst to joining his parents in India, thereafter traversing the British Empire from Bengal to Barbados, and Sydney to southern Ontario.